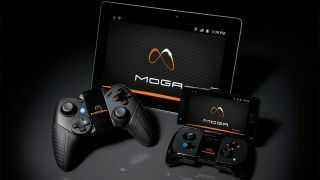 Gaming peripheral company Power A, announced the Moga System for Android devices at E3 2012. The Moga System gaming accessory turns your Android smartphone into a mobile gaming device, with D-pad and buttons for a familiar handheld gaming experience. The standard Moga System, which can house any Android smartphone, even the Samsung Galaxy Note. The Moga System Pro, which is shaped like a typical Xbox 360 controller and can be used to house tablets. "We want to bring console quality experience on a mobile device," says John Moore, DVP, Product Development/Marketing. The free Moga System app comes free when consumers get the controller. Your Android Device pairs with the controller via Bluetooth and it uses two AAA sized batteries, located on the under side of both handgrips. In order to use the Controller however, your games must be Moga compatible. Project A is looking to release the Moga System during the Holiday 2012 season.